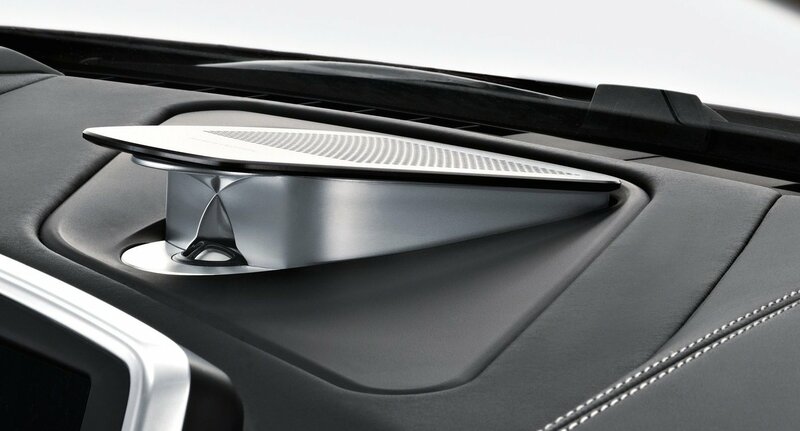 BMW’s dashboard-mounted tweeter makes for some sweet driving sounds. It has often been said that the car is the perfect piece of technology – you just stick your key into it and it works. Yet, with automobiles quickly becoming the next tech battleground – both in terms of the extra functionality manufacturers are cramming into them, and in regards to their inexorable march toward full automation – that long-held simplicity is looking like a frail thing indeed. The fact was driven home for me the other day when I test drove a fully loaded 2014 BMW 750xi Sedan. The $136,000 car was tricked out with just about every technological addition on the market today: a rear-view camera (including night vision), electric rear and side shades, satellite radio, active blind spot detection, a steering wheel that rumbles if you change lanes without signalling, a touch-knob-controlled heads-up-display with GPS and a high-end Bang & Olufson sound system complete with dashboard-mounted tweeter. Truth be told, I felt a little lost. In fact, even the old truism about key simplicity no longer holds in this particular BMW, where the ignition is started by pushing a button on the dash. Its “keys” are just a fob used to unlock the doors. My regular car is a 2003 Toyota Corolla, which might as well have been manufactured before the internet existed. Friends marvel and sometimes snicker at the fact that I still have to manually roll down the windows. About the most technologically advanced thing about it is the fact that it’s black, which helps snow melt off it faster when the sun is out. But it works and I love it and I’m not sure if adding more technology to it would make it that much better (besides maybe power windows). One example: a few years back, I tested out Sirius XM’s then-new Lynx touch-screen satellite radio receiver. I hated it and quickly switched back to my old “analog” receiver, which has a number of simple plastic buttons and a knob for navigating around. The key problem with a touch screen is that you need to look at it when using it, which is not something you should be doing while driving. The plastic buttons and knob, on the other hand, can be manipulated with simple muscle memory – you can change stations but still keep your eyes on the road. BMW and Bang & Olufson at least have the right idea in this regard – they’ve decided against having a touch screen in the 750xi in favour of a centre-console instrument panel with standard buttons and a knob. As a spokesman for the Danish audio company said, Bang & Olufson is rarely first with new technologies; instead, it waits to see how practical they are before adopting them. Touch-screens in cars, at least on the dashboard, may very well be a bad idea. I’m hopeful that automobiles don’t follow the trend of many consumer technologies, where functionality has supplanted ease-of-use. Video game consoles are a great example. Video games ironically emerged in the 1960s as a consumer-friendly demonstration of what computers could do, with consoles in the 1970s finally packing processing power into a couldn’t-be-simpler device. Early consoles from the likes of Atari, Nintendo and Sega were very much like a car: you just plugged a cartridge in and it worked. The previous generation of Xbox and PlayStation consoles ushered in all kinds of innovative functionalities, from online gaming to downloadable content and user-generated sharing, yet they also brought with them a host of annoyances, including multiple logins, frequent downloadable patches and updates and numerous glitches. The days of sitting down and being up-and-running within seconds are long gone. Will they ever get back to those simple days? Who knows. With luck, car manufacturers will avoid such a fate. As it stands, it took me a while to get acquainted with all the BMW’s bells and whistles. Fortunately, the average consumer holds onto his or her car for six years, so that’s plenty of time to get used to all that technology. But with in-car internet connectivity becoming a thing, it’s also conceivable that you might some day have to sit through interminable logins and updates before you can drive anywhere. So much for that simple key in the ignition.